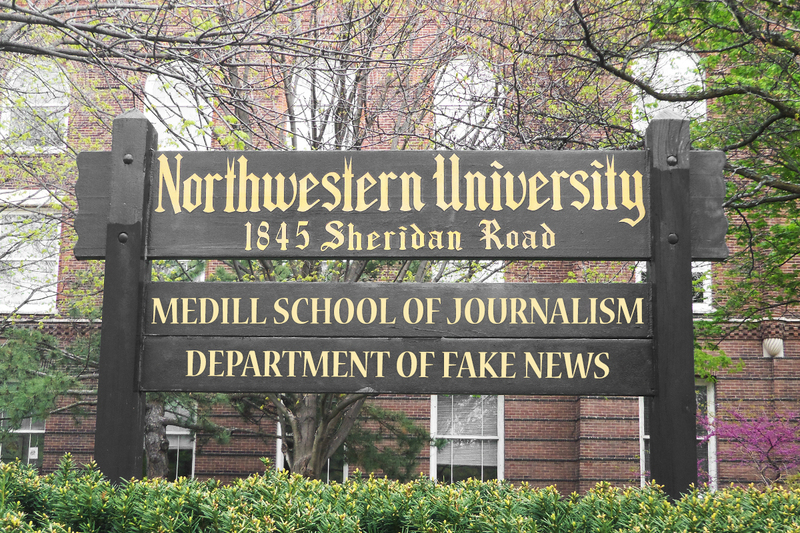 February 8, 1921 –The Joseph Medill School of Journalism at Northwestern University is dedicated with the first classes scheduled to begin the following day. Ceremonies are held in Patten gymnasium on the Evanston campus with “one of Medill’s two daughters, one of his grandsons, three presidents of American universities, editors, business functionaries of great newspaper properties, judges, educators and men of affairs” [Chicago Daily Tribune, February 9, 1921] in attendance. President David Kinley, the president of the University of Illinois talks of three key ingredients necessary for a functioning society … “Faith – that is the church; hope – that is the school; clarity – that is the newspaper." President Warren G. Harding, who had served as the editor of the Marion, Ohio Star for 36 years, sends a message that reads: “Nothing surpasses the possibilities for service that are vested in a great journal commanding the public confidence. That confidence is won through a soul in one’s work and good conscience in every utterance.” Joseph Medill Patterson, on behalf of the Chicago Tribune, a partner in the founding of the school, says, “This school … was not started as a memorial. It was a growing, vital institution before its name was chosen. We are glad and proud that the name it bears was chosen because the name of a man whose record was long and honorable has been given to a school whose record, we believe, will be long and honorable.” Robert R. McCormick, the editor of the Chicago Tribune, sends a letter from Europe in which he writes, “… the soul of our work is service – not alone public service that is wide and inspiring, but as you will find when you at last swing into the work, personal service that imposes many obligations and makes many a heavy draft on your time, your patience, your tact, and upon many occasions, your courage and your loyalty to yourself and your community and country. But I would not have you think of your future as a kind of martyrdom. Yours will be a service that, I insist, is well requited.” Joseph P. Medill, after whom the school is named, was the co-owner and managing editor of the Chicago Tribune for two decades, also serving as the city’s mayor from 1871 to 1873. 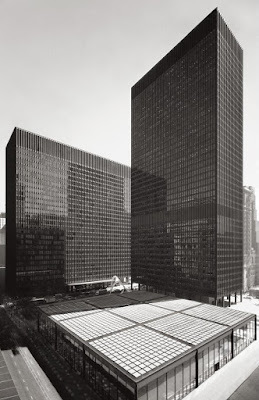 February 8, 1965 – The United States General Services administration accepts the designs for a 44-story federal office building and separate one-story post office that will complete the Chicago Federal Center. In its budget proposal for the next fiscal year the GSA has included $46.2 million for the construction of the two buildings which will be separated from one another by a wide plaza in the 200 block of Dearborn Street across the street from the United States courthouse and federal office building that opened in the fall of 1964. Today's Kluczynski Federal Building is the taller of the three Federal buildings in the above photo. February 8, 1861 – The Chicago Tribune publishes a letter from Captain R. C. Bristol, a citizen of Buffalo, New York, who reminisces about a horrific trip on the first steamboat to reach Chicago in 1832. Four boats started the trip, federal government charters “for the purpose of carrying troops, equipments and provisions to Chicago during the Black Hawk war.” [Chicago Tribune, February 8, 1861] An outbreak of cholera on two of the boats was so severe that they were forced to abandon the voyage, going no farther than Fort Gratiot, a government fort at the point where the Saint Clair River runs into Lake Huron. Cholera also ran rampant on one of the remaining ships, the Henry Clay, and when the boat docked in Chicago “each man sprang on shore, hoping to escape from a scene so terrifying and appalling. Some fled to the fields, some to the woods, while others lay down in the streets and under the cover of the River bank, where most of them died—unwept and alone.” Bristol’s boat lost no one to the disease until it was just north of Muskegon, Michigan, at which point the first death occurred. In the space of a few hours a dozen others died and were thrown overboard. 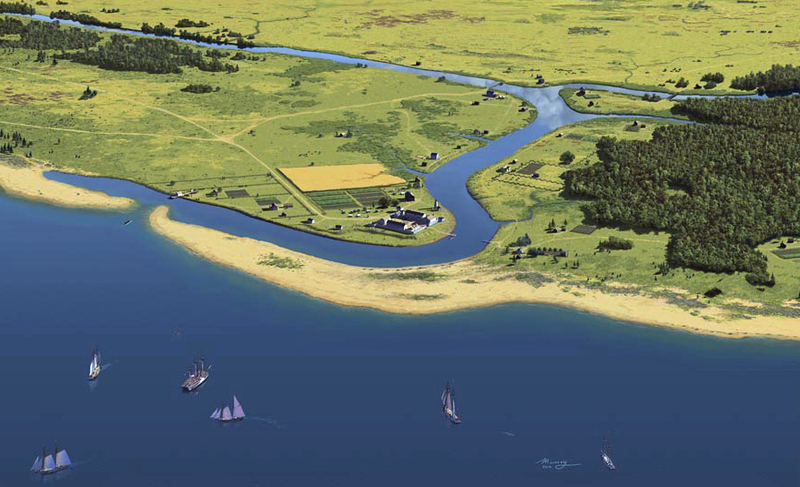 The two stricken vessels arrived in Chicago on the evening of July 8, 1832. Three more crew members died before dawn of July 9, and they, too, were cast over the side “anchored to the bottom in two and a half fathoms, the water being so clear that their forms could be plainly seen from our decks. This unwelcome sight created such excitement—working upon the superstitious fears of some of the crew—that prudence dictated that we weigh anchor and move a distance sufficient to shut from sight a scene which seemed to haunt the imagination and influence the mind with thoughts of some portentous evil.” In the next four days cholera claimed another 54 of the men who had sailed on the two boats. Difficult to believe from the above illustration from the Raymond Massey Limited Edition website, that today's Michigan Avenue crosses the river where the little cluster of buildings that made up Fort Dearborn sit as the stream rolls south toward today's Madison Street. 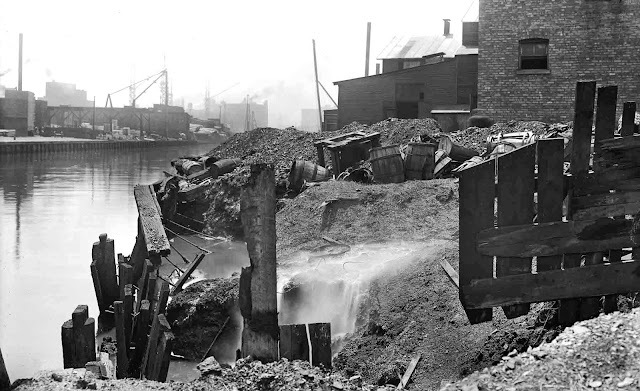 February 8, 1900 -- For the first time since the Chicago Sanitary and Ship Canal was opened in January the Chicago River reversed its westerly flow and headed into the lake. By evening a severe storm out of the southwest had flushed the sewers and washed the streets, sending the sewage in the water more than a mile into the lake, threatening the cribs that supplied drinking water to the city. The Chicago Daily Tribune reported, "The stream, which has been almost as blue as the lake, turned back to its old dingy black. The stopping of the current was bad enough with this burden of sewage thrust upon the channel, but the trouble was increased further by the wind, which blew a gale from the southwest and lowered the water in the main river over a foot. This caused a slight flow lake ward, and when the black water reached the piers the wind wafted it toward the cribs." It was another day in Chicago when it was safer to drink the whiskey than to trust the water.